A lush, graceful 5′ – 8′ shrub with weeping branches, much like a fountain, & narrow apple-green foliage. 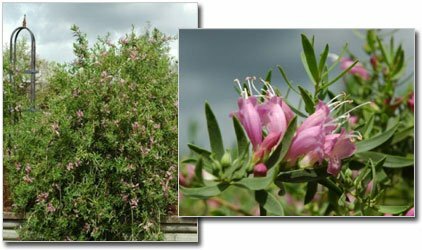 It produces a profusion of tubular, flared-lipped pink flowers in the spring. 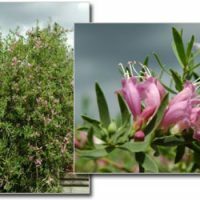 Pink Emu Bush is a must for hummingbirds & birds eat the hard, dry fruit. Very drought tolerant once established & needs full sun & good drainage. Responds well to pruning. Hardy to 25 degrees F.